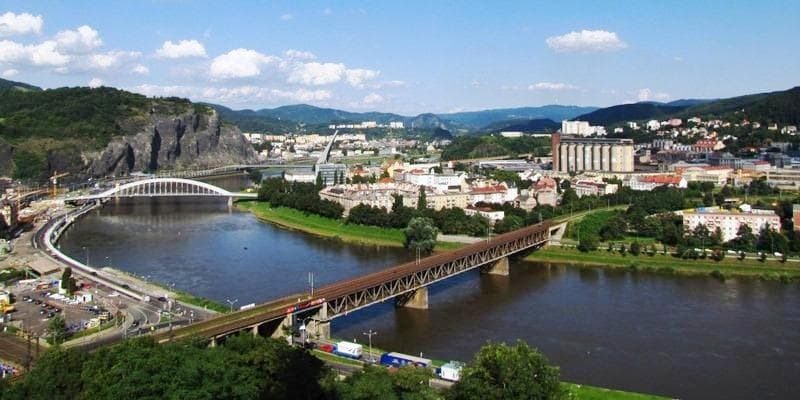 On 1 May 2014, the neo-Nazi Workers’ Social Justice Party (Dělnická strana sociální spravedlnosti – DSSS) marched through the center of Ústí nad Labem together with affiliated neo-Nazis from other countries of Central Europe and Italy. 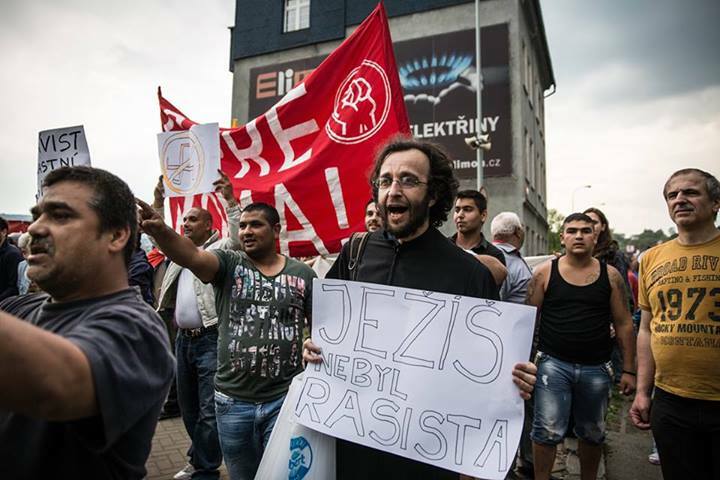 Ordinary residents of the town came together with anti-fascists to protest the march, and what is most important, Romani residents of Ústí were among them who set out on a march from the ghetto in Předlice to the center of town to protect impoverished residential hotels and stop the neo-Nazi march. They were not alone, as Romani people from other towns came to help. The neo-Nazi march ended up being a fiasco and the opponents of neo-Nazism celebrated that. What happened on 1 May was something completely unique for Czech conditions. Many circumstances and factors contributed to it turning out this way, and this piece will attempt to describe the events in Ústí from the perspective of the Konexe civic association, whose activities played an important role. Prior to the march, our community empowerment team began working in parts of town predominantly inhabited by Romani people. We provided local Roma with information about the Nazi march being planned in the town. Many things made our work much easier, such as the fact the Konexe organization is headquartered in Ústí and we know the terrain there very well because several of our Romani members are also residents of its localities. One person who was important to our activity was Jaroslav G., a leading member of the Romani community in Ústí, who began helping us as a volunteer with all of his energy, basically full-time, irrespective of any repercussions or risks to him personally (he had just undergone a heart operation). Jaroslav’s face and name opened up all of the doors in the Romani community. There was an unending series of discussions and meetings, some of which were very tempestuous. Together with the local Roma, we began to create a plan for 1 May. We announced our own assembly for all of the public spaces along the access roads into the Předlice ghetto, the streets in the ghetto, and Klíšská Street, which links the center of town to the Klíše quarter. We evaluated the greatest risk of the neo-Nazi march as being the scenario in which a large number of neo-Nazis would gather, attempt to change the route of the march after it was underway, and attack the four Romani-occupied buildings on Klíšská Street. Given that the route of the march passed about 200 meters way from those buildings and that a massive neo-Nazi mobilization effort for the demonstration was underway online, we considered that risk to be very real. Our volunteers began visiting the Romani families living in those buildings, half of which are run as residential hotels, ahead of 1 May. Again, the situation was easier for us because we had helped some families there in the past, so we did not have to earn their trust from scratch, but we already had it from the beginning. Gradually a plan was developed that, on the day of the Nazi march, we would convene two public assemblies, one on Klíšská Street in order to occupy the public space in front of those buildings as human shields. The other assembly would be situated in a parking lot for long-haul trucks on Sklářská Street, i.e., at the part of the Předlice ghetto that is closest to the center of town andKlíšská Street. At the same time we reached out to other groups and organizations with requests for aid and support. The Romani association “Smysl života” (Meaning of Life) from Děčín promised to make goulash for those participating in our assemblies, a group of engagé non-Roma from Ústí promised to make soup, and support was promised by Romani people from Duchcov and Krupka. On the day of the march we also arranged a telephone information line where people could call and find out in real time what the situation was a various points in town and where we needed the most help. The assembly on Klíšská Street was of a purely protective nature and was small, with a maximum of several dozen activists in front of the buildings, most of them from our affiliated groups in Germany. Only the very bravest Romani residents of Klíšská Street dared join those on the street, while most of the others barricaded themselves into their homes out of fear. Our multidisciplinary team, who have a great deal of experience with similar situations, was inside those buildings providing those people with support. The point of the assembly on Sklářská Street was primarily to bring together as many Romani people as possible and to give them a feeling of self-confidence and strength. A podium was erected and Romani bands performed, interspersed with speakers, most of them local Roma, talking about the situation in the ghetto, the situation of Romani people in Czech society, and other matters. There was also dancing. A common prayer for peace and against violence was held and a clergyman blessed everyone.Our experienced volunteers had designed a rich program for the children, with arts, handicraft and movement activities, and we erected a puppet theater and performed a show to distract the children’s attention from what was going on and prevent their becoming traumatized. Food was distributed for free at both assemblies, vegan soup on Klíšská Street and Romani goulash on Sklářská Street. A joint press conference was also held on Sklářská Street by members of the Konexe organization and residents of Předlice. The most impoverished residents on Klíšská Street also received clothing that had been brought by the anti-fascists from Germany as gifts. A large part of the activity and work connected with the running of both of these demonstrations was done by local Roma themselves, who learned very rapidly how to do everything. The situation was not one in which local Roma were in the role of victims being supported by Konexe as a Romani nonprofit – they were the ones supporting us. Key coordinators from Konexe were immediately assigned local Romani bodyguards at the start of these assemblies to keep an eye on their personal security. An estimated several dozen people joined in our activities in both locations and began helping us out, both non-Roma and Romani people from out of town whom we met that day for the first time and with whom we will remain friends forever. During the whole time we carefully followed the situation on Mírové náměstí, where the neo-Nazis were supposed to gather prior to beginning their march, as well as in the center of town where several political movements and parties were assembling and where many anti-fascists were moving around who had announced their intention to blockade the Nazis’ march through the town. The situation in town from the beginning seemed unpredictable, but it gradually began to be clear that the more than 500 Nazis promised had not made it to town, just about 200 of them. The sense of threat was reduced by this information. When neo-Nazi leader Tomáš Vandas began to speak on the square at around 3 PM, and we announced through the microphone at our assembly the number of neo-Nazis, the tension at both of our assemblies disappeared. The Roma at the Sklářská Street assembly decided at that moment to go take a look at the Nazis, to show them that we are not afraid of them and that this is our home. In an atmosphere of euphoria and with powerful chants of the slogans “Nazism is dirt and filth!”, “No violence!”, “Stop pogroms!” and “Black, white, let’s unite!”, they began to march into the town center. The march on foot was followed by a long convoy of automobiles honking their horns and transporting other Romani people who waved passionately at passers-by from the car windows. When the whole formation made it to Klíšská Street, it was enthusiastically welcomed by local Roma there, who came out of their homes with newly-energized bravery and joined the other Roma from Předlice. After a brief negotiation with police, everyone set out for the center of town to encounter the neo-Nazi march. The most emotional moment of the whole day then happened – a march of “white” anti-fascists came down Londýnská Street and met up with the Romani march. Both of the marches then became one big procession. That slogan that we have all chanted so many times, “Black, white, let’s unite!” became a reality. People were embracing and some were weeping. The procession continued down Klíšská Street toward the march route of the neo-Nazis and after roughly 100 meters was stopped by a police barricade. We waited behind the barricade for the neo-Nazis. 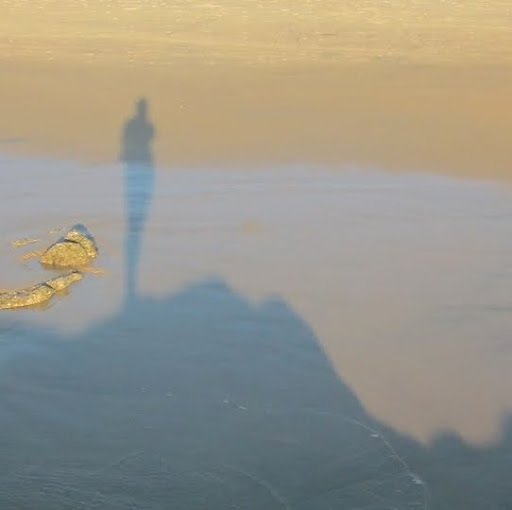 They arrived a moment later. No one in our gathering was afraid and everyone – the Nazis, the police, and we ourselves – could sense that the advantage was on our side. After a moment the Nazis were out of sight and marching back to the town center, where their assembly ended. The Roma calmly returned by the same route to Předlice, where many of them celebrated their victory over evil, hatred, and their own fear for a long time. For its part, the neo-Nazi march did not receive support from other residents of the town. On the contrary, a significant number of citizens and local organizations displayed their disagreement with the neo-Nazi march. At several points along the DSSS march route, people held up signs with messages ridiculing the marching neo-Nazis, put up small posters comparing the neo-Nazis to sheep, etc..
An observer might think that these kinds of protests are, in comparison with the civilian protests against neo-Nazi marches to the west of our borders, ineffective and merely symbolic, but in the Czech Republic such protests are above-standard, rare, unusual, and very needed. With a bit of optimism it can be believed that this is the beginning of future protests that will not just be symbolic, but effective, real protests by citizens against the neo-Nazi marches through the streets of our towns. Support from out-of-town anti-fascists, both non-radical and radical, was very important (these people are called “anarchists” in the language of the Czech media, but in reality they comprise a very diverse mixture of people with various world views) who came to Ústí from all over the Czech Republic and in the same numbers from Germany. It was they who created a mass together with the Roma that would have prevented attacks on the “Romani” buildings on Klíšská Street in the event of the worst-case scenario of large numbers of neo-Nazis breaking through the police barricades, and if police had been absent they would have easily managed to block the neo-Nazi march. We consider the media coverage of this entire event to have been deficient and the image of it created in the Czech media to have been distorted. For the Czech media the events in Ústí were probably too complex and complicated for them to cover and objectively report on in their entirety. The media did not manage to estimate the actual numbers of those participating in the various assemblies at various locations, was unable to respond to the rapidly-changing events, constantly released imprecise pieces of information both large and small, and confused various activities and assemblies with one another. They were unable to distinguish which events were important at a specific time and which weren’t. The joint press conference by Konexe and the Romani residents of Předlice did not attract many Czech media outlets, not even those that declare themselves to be pro-Romani. They do not take much of an interest in how impoverished Romani people in the ghettos experience the neo-Nazi marches and what they want to tell the public, but our press conference was attended by all of the foreign journalists who were in Ústí on 1 May. Another thing about the press coverage is that, after the official end of the neo-Nazi march, the journalists, to put it colloquially, “split”, abandoning the field even though events were continuing, and many incidents then occurred without any media coverage whatsoever. For example, a group of neo-Nazis attempted, after the official end of the DSSS assembly, to break through to the Romani people on Klíšská Street, failed, and fled into the nearby Kaufland shopping center, which was subsequently closed by police who sent riot units to intervene against them and arrested them all. We thank everyone who did what they could to help.